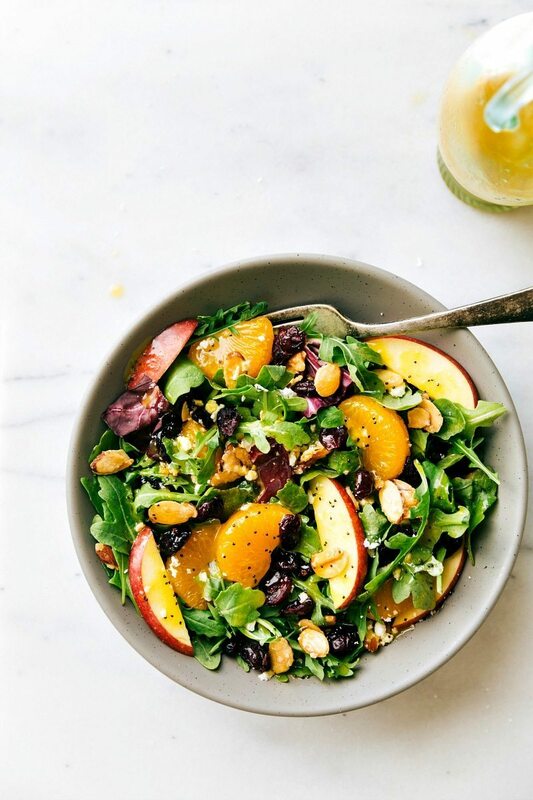 This mandarin orange salad is packed with delicious flavors: mandarin oranges, apples, cranberries, feta cheese, and easy stovetop candied almonds. 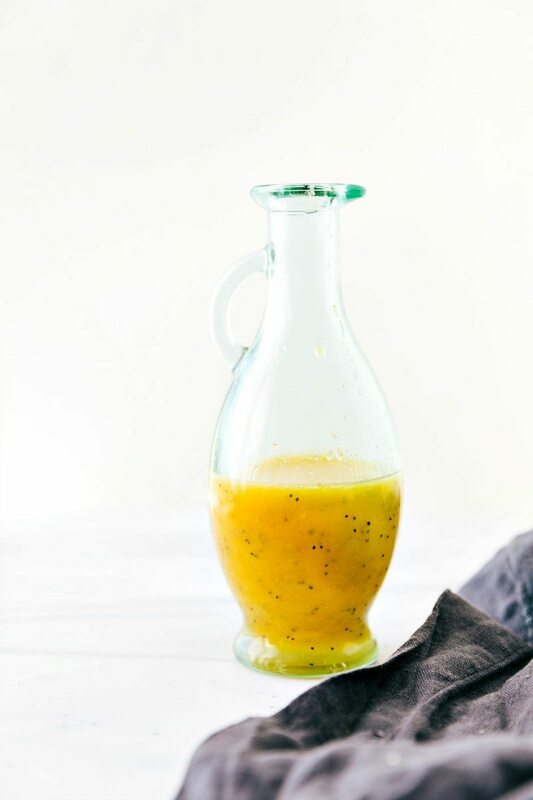 Plus an easy citrus vinaigrette that is sweet, tangy, and refreshing! When I was about thirteen years old I became obsessed with dinner parties. And by “dinner parties” I mean decorating the dining table for a fancier family dinner. We have nine people total in my family, so it makes for a pretty good “party”. I’d recruit my younger sister and we would make a pop-up type restaurant in our kitchen. We’d hang sheets to divide the dining table from the kitchen and set up an elaborate “restaurant” using stuffed animals from our bedrooms or (I’m sure to my mother’s dismay) removing various decorations from the rest of the home to add it to our restaurant. One time we did an Asian-inspired restaurant which was extremely decorated thanks to my obsession with panda bears and bamboo plants. I’m pretty sure there was very little room for my family to even set down a plate. We’d decorate our own menus in the “Paint” program of the computer complete with a ridiculous amount of bright-colored “shapes” for menu decorations. We’d prepare the food based off our menus and then serve it to the rest of our family on trays. This past Monday, I had the amazing opportunity to visit a pop-up restaurant in Nashville, Tennessee for their second filming of Morton Salt’s Next Door Chef. A novice cook and his wife (Travis and Claire) transformed their home into a pop-up one-night-only dining experience. Travis was taught by an acclaimed Nashville chef how to make an amazing meal using various types of salt. There were beautifully written chalkboard menus inside the home next to the kitchen and an entire restaurant scene set up in their backyard. String lights, rustic tables, tea light candles, freshly cut yellow flowers, clipboard menus, and live music were some of the highlights of the restaurant. It was so beautifully set-up and, as cheesy as it sounds, truly a dream for the little girl that used to make pop-up restaurants using stuffed animals and household fake plants for decorations. While the ambience was truly incredible, the food was even better. I can honestly say I had the very best prepared beets I’ve ever eaten in one of the dishes served to us. At the event, we were taught the benefits of using Morton Kosher and Sea Salt versus standard table salt when cooking. It is amazing to hear all the ways salt can completely transform a dish. I’ll be sharing more information about the salt and food we enjoyed in a few months! And now on to the salad! 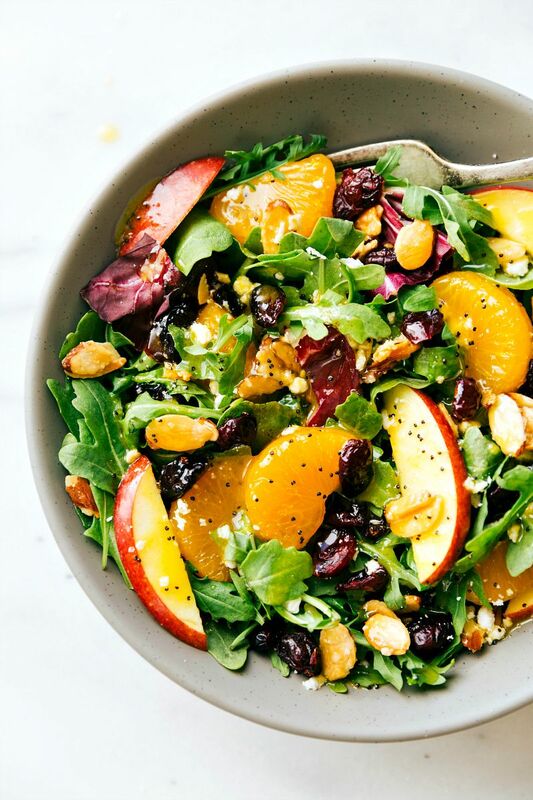 This salad has all of my favorite components — fruit, candied nuts, and a sweet poppyseed dressing. It’s an absolute must-try this holiday season! 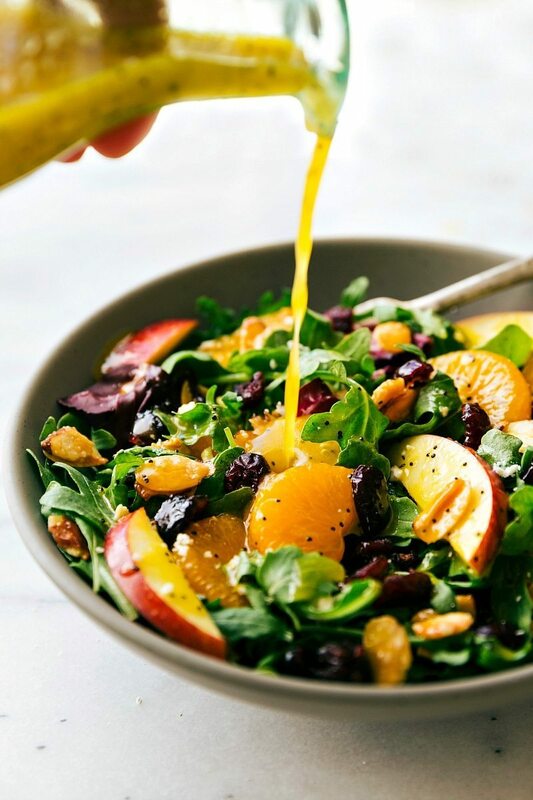 Thanks to the fine sea salt in the dressing, the orange poppyseed dressing in this salad is perfectly seasoned and the sweetness is balanced perfectly. The dressing is a matter of just blending a few ingredients together and it’s all ready to go. The fruit is super quick to prepare especially if you opt for using canned mandarin oranges. As much as I love fresh clementines, canned mandarin oranges make a pretty delicious salad addition because of their sweetness from the syrup they are canned in and their soft texture. You’ll get plenty of crunch from the apple so it’s nice to have the two different textures. And finally, the nuts. If you’ve never tried to candy nuts, this is the place to start. You don’t need a ridiculous amount of ingredients (only TWO — the nuts and sugar) and it can all be done on the stovetop instead of in the oven. 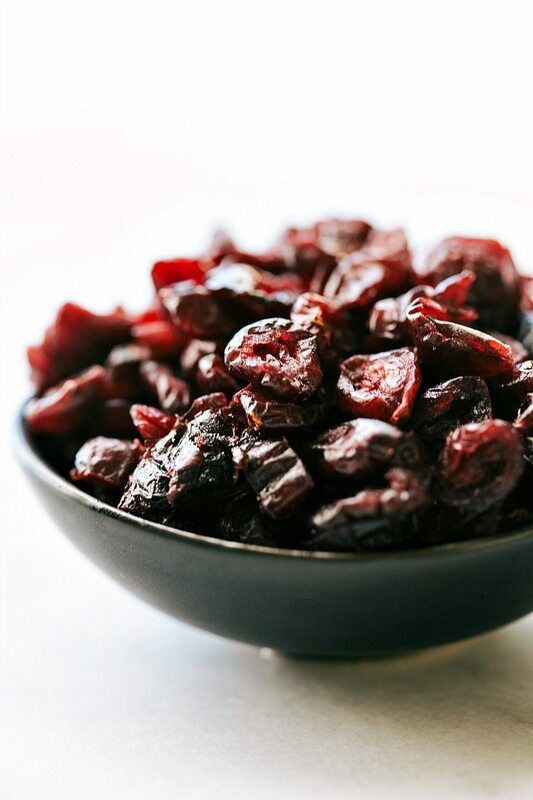 Making candied almonds is quick and adds a lot to a simple salad. Hope you get a chance to try this salad sometime this holiday season and that you LOVE it. I can’t wait to share more with you about the recipes we tried at the event this past week. 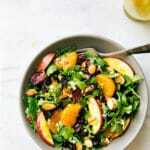 A great holiday entertaining salad -- mandarin orange, apples, cranberries, feta cheese, and easy stovetop candied almonds all covered in a delicious orange poppyseed dressing. In a large skillet, add the sliced almonds and white sugar. Place the heat to medium-high and stir near constantly. The sugar will begin to melt and become a sticky liquid and then stick to the almonds. This takes about 3-4 minutes -- watch carefully and stir near constantly to avoid burning the nuts. Thinly slice the apples and toss with lemon juice. In a large bowl, toss together the lettuce, well-drained mandarin oranges, sliced apples, dried cranberries, and feta cheese. For the dressing: combine all of the ingredients together except for the oil and poppyseed in a blender. Blend until all ingredients are well incorporated. Slowly add in the oil in a steady stream and pulse until combined. Right before enjoying, add the dressing (add to taste -- you may not need it all) and candied almonds. Toss and enjoy immediately. 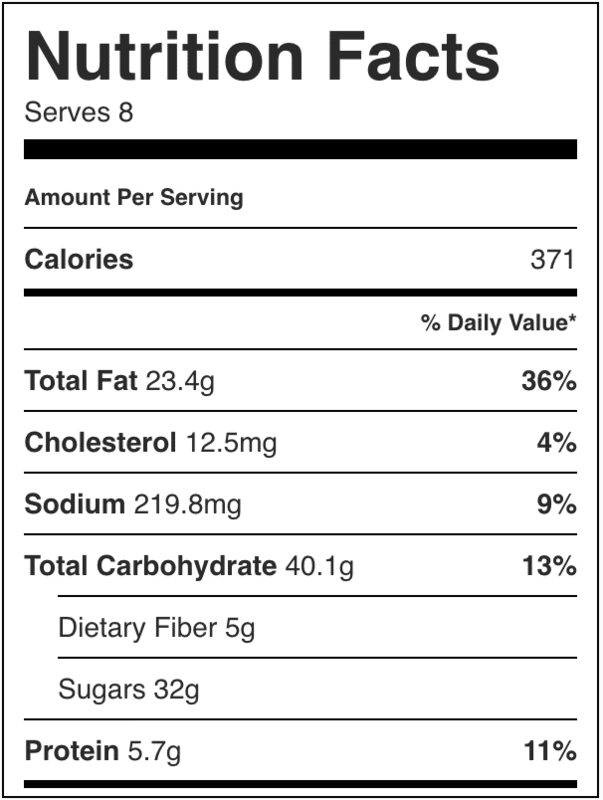 Was going to make the salad today, but there’s no print option!? There is 🙂 Underneath the small image in the recipe card is a small button labeled “print” Enjoy Bonnie! This sounds like a great event and I had fun looking at the pictures, Chelsea! Your pictures seriously are soo pretty. Just hoping we can get to half the quality of your photos one day. What delicious flavors! What fun memories of having fancy family meals as together! This looks amazingly fresh and delicious!! I’ve never made homemade poppyseed dressing or even thought to try it til now, but I’m inspired!! Does the entire orange go into the dressing. Or just the zest and the small amount of juice? Good salad but be careful not to use too much dressing, which makes it too wet.i would use less orange juice next time. Had a few oranges laying around and wanted to use them before they go bad. Made this recipe with fresh oranges. Added mixed grapes and cucumbers. Turned out really good. It was like a party in my mouth…. ? What are your thoughts on using goat cheese with this salad instead of feta? This was delicious. Had lunch at St Hubert yesterday and had their Bangkok salad. It inspired me to try to make it at home. I halved this recipe, added bean sprouts and chose spinach, fresh blood oranges and made candied pecans. Added 2 grilled chicken breasts marinated in a herbs and garlic marinade and toasted a slice of multigrain bread, lightly buttered. I will add quinoa to the leftovers. I’m looking forward to supper. So–how many does this serve, approximately? I made this for a dinner party and it was one of the most delicious salad ingredient combinations I’ve ever eaten. My guests were gushing with complements, even the men that aren’t bug salad eaters! I’ll make this one again very soon! I’ve been making this salad with a store bought raspberry walnut vinaigrette for a long time now. I made your orange poppyseed dressing and it was delicious! Very tasty! My new go too dressing!